If you’re on the fence between M1 Finance vs Robinhood, this comparison should clear the fog. Both brokers feature free stock trading so price-sensitive traders won’t be able to separate them on cost. Where they diverge is on account selection, portfolio management, mobile access, tools, and investment selection. Let’s dive in to see which is the best broker for you? What Are M1 Finance Pies? Can you day trade on Robinhood? How long does it take Robinhood to settle funds? How long does it take to get money from Robinhood? How long does it take Robinhood to approve your account? Does Robinhood have withdrawal limits? Launched in 2014, Robinhood is a free mobile and web app that guides clients taking their first steps from the turf of non-investors into the territory of stock trading. Since its launch, Robinhood has quickly become one of the apps of choice among younger and beginning investors who seek commission-free trades on the go. Whether stocks, options, or cryptocurrencies are top of your trading list, Robinhood supports them all. Once you get your feet wet as in investor, Robinhood Gold offers you a step up to the next level, which is a margin account. You must maintain a minimum balance in a maintenance account. You must pay a fee for what you borrow. You can only borrow 50% more than your account balance. You have to maintain a minimum $2,000 balance as required by law. Some of the advantages of a Robinhood Gold account are expanding your buying capital while continuing to make commission-free trades, immediate access to proceeds from stock sales, expanded trading hours from 9 a.m. → 6 p.m. and a predictable monthly fee instead of varying interest. Robinhood must meet the same Securities and Exchange Commission regulations as any brokerage firm. These rules aim to minimize fraud and eliminate unfair trading practices. The Robinhood app also operates under the guidelines of the Securities Investor Protection Corporation (SIPC), which protects clients from losses of up to $500,000 for securities and $250,000 for cash in investment accounts if the losses are due to the financial instability of the brokerage company. So, if you use Robinhood, you and your funds are heavily protected from specific threats. M1 Finance is a broker that provides you with a platform to craft your own portfolio, copy a professionally designed portfolio or even automate an investment strategy. Trading on the M1 Finance platform is free, provided you keep a minimum balance of $100 in your taxable account or $500 in an IRA account. A choice of 60+ model portfolios are at your fingertips and geared toward specific financial goals, like sending your kids to college or funding your retirement. A popular feature is called Pies, which are divided into two overall categories: MyPies and Expert Pies. The platform lets you select how you would like your investment funds distributed and then automates those choices. Expert Pies include eight categories representing the most common investing goals. For example, if you are setting your sights on funding your retirement, you could opt into a premade pie portfolio designed for just that purpose. You could also create your own plan in the MyPies category by choosing where you would like to invest each pie segment. M1 Finance also gives you the flexibility to customize one of its premade portfolios. The best part is computer algorithms automatically keep your pie balanced to optimize your ROI. Get Excited by M1 Finance! The primary benefit of each brokerage platform includes commission-free stock trading. Free market data, web-based and mobile apps are highlights too. One main area where M1 Finance and Robinhood diverge is the type of investing each makes available to you. For example, M1 Finance offers bond trading while Robinhood does not. On the other hand, Robinhood offers options trading, which allows you more flexibility plus a greater ability to manage investment risk. M1 Finance does not. The Robinhood app wins points for providing plenty of leeway when you want to get hands-on experience investing your money in stocks, ETFs and tradable securities. Less automation means more immersion and therefore a more in-depth learning experience that will stand you in good stead as you grow as an investor. Unlike M1 Finance, Robinhood is cryptocurrency-friendly. If you are curious about investing in virtual currencies such as Bitcoin or Ethereum, you can use this app to dive in. 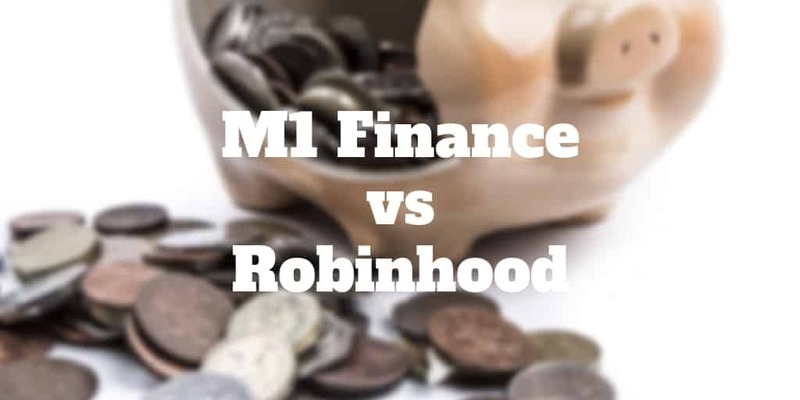 As far as keeping a finger on the pulse of market trends, both brokers provide investment product overviews; however, neither M1 Finance nor Robinhood offers much in the way of market research and resource material. With that said, M1 Finance features some resources, including blog posts on various investment topics and emergent trends. Both Robinhood and M1 Finance offer free trading, meaning no commissions charges, but you will still pay clearing fees charged by exchanges. Robinhood clients who wish to trade on margin must pay for the privilege. Straight stock and options trades are commission-free with the Robinhood app. When you want to open a margin account to take advantage of greater financial flexibility for your portfolio, you must keep a minimum of $2,000 in your account. Unlike many robo-advisor apps that charge interest on margin trading, Robinhood withdraws a set monthly fee from your account, which is based on your margin, or buying power, and your account balance. For example, if your balance is between $6,000 and $12,000 and your buying power is within the $2,000 to $6,000 range, your monthly fee ranges from $10 → $25 per month. This investment app simplifies transfers to maintain your minimum with a no-cost Robinhood Instant upgrade. Instant also facilitates immediate trade proceeds deposits. While M1 Finance has not charged commissions to users since 2017, it requires that you establish a standard account with a first deposit of $100 or a retirement account with at least $500. Once you have taken care of that detail, your stock and ETF trades are free. You know that these brokers have to make their money somehow to justify their existence and may wonder how they do that without charging commissions? One way the Robinhood app generates revenue is by earning interest on the money in your margin account and passing any regulatory fees associated with trades on to you. It also collects $10 per call if you choose to speak with a live trader. Robinhood collects those monthly fees assessed on its Gold margin accounts. It earns per-trade revenue on its recently launched cryptocurrency trading platform as well. Similarly, M1 Finance makes some of its money on the unused cash in its required customer accounts. It also collects proceeds from fees paid for directed orders, cash management and securities sold short. Investment minimums can come into play immediately, in the case of M1 Finance, or at a later date, which is the case for Robinhood. As mentioned, you must have either $100 or $500 to lay down in a reserve account if you want to use M1 Finance. Once you start trading, you won’t be penalized if balances dip below those levels. You can jump right into trading with Robinhood because no deposit is required. Of course, you do need enough funding to pay for your investment purchases. Once you feel comfortable with trading and want more flexibility, you may want to establish a margin account with Robinhood, which requires a minimum cash commitment of $2,000 on an ongoing basis. Beyond the standard taxable accounts, both brokers offer some additional account types. Robinhood offers the Instant account; the Robinhood Gold upgrade, which is a margin account; and a Cash account. Robinhood Instant streamlines fund processing and comes with after-hours trading privileges. The Robinhood Gold upgrade lets you borrow up to half of your balance for trading purposes while the Cash account does not offer the premium features of Instant or Gold. You can establish a brokerage account with M1 Finance with a taxable minimum balance of $100. For example, you might want a joint brokerage account for you and your spouse. Retirement account options include a traditional IRA, a Roth IRA, a SEP IRA or a Rollover IRA, each requiring a $500 minimum deposit. M1 Finance also provides a trust account option, which requires that you fill out some paperwork. A tax strategy is a critical component of your overall trading plan. Robinhood does not offer a tax-deferred account option, so you will find yourself paying tax on any income you make from your investments. The app will provide you with a tax statement on your trades, so you can report gains to the IRS. M1 Finance provides a tax-deferred account option where you can squirrel away your investment proceeds. What you eventually pass on to the IRS depends upon the terms of the particular type of IRA you choose. ✅ No Commissions: Few brokers rival Robinhood’s zero commissions policy but M1 Finance is that rare exception. ✅ No Commissions: Robinhood made famous the idea of free stock trading and lives up to its promise. ✅ Automated Investment Management: Premade portfolios and ongoing management of custom built portfolios give M1 Finance the edge. ✅ Cryptocurrency Trading: Want to trade Bitcoin, Ethereum, or Litecoin? Robinhood supports virtual currency trading but M1 Finance does not. ✅ Account Selection: M1 Finance supports both taxable and retirement accounts whereas Robinhood only caters to standard accounts. ✅ Mobile Trading: On-the-go traders can trade wherever they are on the Robinhood app. ✅ Hybrid Service: M1 Finance is less a broker as much as it is a hybrid between a robo-advisor and a discount brokerage firms so it caters to a wider customer base. ✅ Margin Trading: Margin trading is available via Robinhood Gold to clients who want to boost buying power. If you do not have the time or the enthusiasm to devote to building a portfolio from scratch, you will probably find the M1 Finance pie system more user-friendly and manageable. In contrast, if you want to pull yourself up by the bootstraps and really learn as you go, starting off with a simple yet robust platform like Robinhood may be the better choice for you. Robinhood Instant and Robinhood Gold accounts are limited to 3 trades per day. Accounts with balances of $25,000 and higher may be eligible for day trading. Typically, it takes 2 days for funds to settle. Deposits must remain in Robinhood for at least five days before withdrawals can be initiated (to comply with money-laundering laws). On day 6, uninvested funds are transferred to your cash account to be withdrawn. The account approval process generally takes 2 → 3 days at most. Yes, the daily limit for deposits and withdrawals is $50,000. ‹ SoFi Wealth Management vs. Wealthfront: Which Robo-Advisor Is Better?